How Are You Organizing Your Social Media Team? In the marketing minds of companies looking to dash into the social media marathon of consumer engagement, there seems to be one burning question: how do I craft a social media department that can sustain company values while tip-toeing the social tightrope of ingenuity and innovation (without falling over the cliff of digital obscurity)? Hmmm…a challenging question, to be sure, and one that is not easily answered. In order to ease the troubled minds of businesses, Alltop.com published an infographic that statistically explains how companies go about structuring social media teams. The full infographic can be found HERE or by clicking the photo below. According to Alltop, 42% of social media jobs are given to one person and 65% of social media tasks are assigned on top of current job responsibilities. Maybe you can relate to this, and have juggled coffee drinking with content posting, blogging and trying to remain sane under the ever-expanding to-do lists that you have created for yourself. But really, it goes to show that in order to remain in the social game, you have to be an octopus of a worker, and will probably think more than once that octopuses should have been given 16 arms instead of 8 (or 6 depending on what scientist you talk to and whether they classify the last two limbs as legs or not). 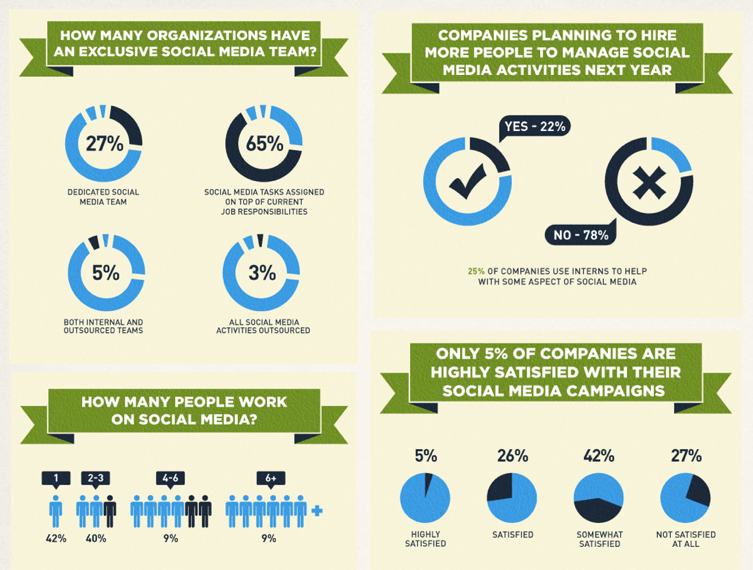 As the infographic says, only 25% of companies have interns monitoring and handling social media. Sure, this is a cost-efficient strategy, but is this a good thing? With the high turnaround rates of internships and questions concerning company/client confidentiality, it seems quite absurd that companies who understand the immense value of social media are willing to place their social stock in the hands of interns who can be under-qualified and inexperienced. And what happens when an intern is offered a job at another company? You can pretty much throw social consistency out the window, as bringing on a new intern can jeopardize the company voice the previous intern had been working diligently (or non-diligently) to create. Social media is a young person’s game. With 47% of jobs going to those with 1-3 years of experience, and 44% going to those with 3-5 years, it’s clear that social media is taking the trend of professional athletics where 30+ years-old is linked to retirement time. This means that today’s youth have the task of carrying social media into the future, while more experience marketers are being left in the dust of Youtube videos and tweets that derive their inspiration from the fountain of youth. With 86% of social success based on a company’s # of likes/followers, it’s no wonder why businesses are continually failing in social media. It’s like television networks that cancel quality shows because ratings are not high enough, or when small businesses are lost in the mega shadows of corporate America because they do not have the following of Starbucks, or the capacity to serve a million people at once. The numbers game is great for finances, or baseball stats, but engagement is the key factor when it comes to social media. Now, after sifting through the infographic, do you think your social media team is structured properly? If not, shoot me some questions and let’s discuss the ways you can create a more well-rounded social space for your company and its employees. Post really hits home, great focus points. Working with musicians I see a common problem with the perceived social success point. Numbers wow certain people more than looking at the quality control of a message. Can be difficult at times getting some musicians to see that social media does include alot of multitasking that needs to be controlled with a plan in mind, but with the way some social networks are trivialized as random message boards, it can be difficult implementing plans with a casual user looking to properly promote. From your experience, have you seen success in smaller or bigger social media teams? Curious to see how expansion in this area has either helped or hurt from what you have seen. There certainly is a balance with social media, and while spontaneity plays a role, social media teams must be calculating while trying to stay authentic, which is not an easy thing to do. I think people often get overwhelmed when trying to keep pace with social media, and in their efforts to keep up, content becomes automated and robotic, which is rather tragic since social media, at its very core, is social, genuine and unscripted. However, I have also been a part of teams that understand the value of togetherness, and can patch collective differences into a quilt of commonality. This requires selflessness and the desire to work for the common good; it requires steady conversation and a healthy dose of patience. But when done properly, it can be a beautiful thing. Overall, I think businesses need to evaluate their own understanding of social media, and determine whether the workload is better suited for an individual with a big heart, or a team with a steady heartbeat. Thanks for your wonderful comment, and I am happy you found value in this post. Let’s talk and you will receive fresh ideas to get more customers! Check here if you want to receive a copy of Branding Personality's E-Book, "The Art of Cultivating Social Media." May 1 How to take an old-school business to the 21st century? Feb 25 Are Free Giveaways a Sound Strategy for Your Brand?